Damning expectations is part of Posner’s modus operandi when it comes to Shakespeare, but he’s upending the wrong anticipations in this production. Jealousy rises in Leontes (Michael Tisdale) as his wife Hermione (Katie deBuys) and best friend Polixenes (Aldo Billingslea) converse in the Folger Theatre production of William Shakespeare's The Winter's Tale. Below, Florezell (Drew Drake) and Perdita (Daven Ralston). 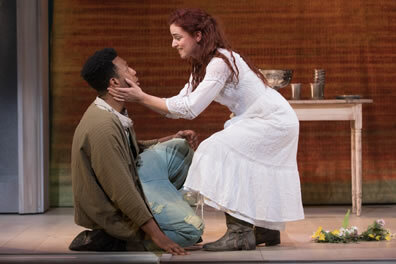 Photos by Teresa Wood, Folger Theatre. 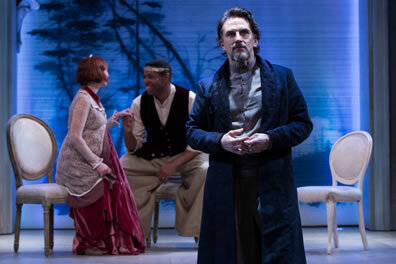 The Aaron Posner–helmed production of William Shakespeare’s The Winter’s Tale at the Folger Theatre reaches its zenith on the sea coast of Bohemia. You know the scene, famous for Shakespeare’s best-known stage direction. Antigonus (Eric Hissom) is carrying the baby cast away by the Sicilian King Leontes who thinks it’s illegitimately bred by his wife, Hermione, and his best friend, Bohemia's King Polixenes. Antigonus places the baby named Perdita in her basket on the ground as the storm begins to rage. He starts to leave, and then hears a most disturbing noise: It is Perdita, who begins crying (vocalized by Daven Ralston, kneeling at the side of the stage). Antigonus goes back to the basket, picks up the baby, and sings a lullaby, soothing her. This may be one of my favorite-ever moments in any Winter’s Tale I’ve seen, Hissom gently comforting the baby in a pause of beautiful song amid the violence rising about him. And then tragedy strikes: No, it's not a bear. A more carnivorous beast intrudes on this expectant moment and Shakespeare’s play on the whole: The director. We hear a bear roar, Hissom puts the baby back in the basket, runs behind a screen and, stopping under a spotlight, shouts, “Exit, pursued by a bear.”A handful of people in the packed theater laugh. The woman next to me would complain at the intermission that she wanted to see the bear, since a polar bear is so prominently displayed in the play’s publicity literature. I, too, was eagerly awaiting what allegorical magic Posner would deploy to represent the bear, and now I’m bent over, rubbing my forehead as Sarah, my wife, leans in and asks if I'm OK. “No,” I reply, and then realize her concern stems from my not feeling well earlier in the day. I quickly reassure her, “It’s not physical.” "Oh," she whispers. "Got it." This flippant staging of the famous Shakespearean episode actually has thematic underpinning in Posner’s take on The Winter's Tale, which he presents in the mode of a bedtime fairy tale. In addition to playing Antigonus, Hissom switches jackets and cap and dons glasses to play Camillo, the advisor Leontes ordered to poison Polixenes; Camillo instead helps the Bohemian king escape the Sicilian king’s jealous rage. The cast list also identifies Hissom as “Storyteller,” combining into the service of a narrator the play’s gossiping gentlemen, messengers, the role of Time, and, apparently, Camillo and Antigonus, too. Hissom announcing that he’s exiting, pursued by a bear, is more integral to his role as Storyteller—and, thus, this production's aesthete—than Antigonus actually exiting being pursued by a bear, audience expectations be damned. Damning expectations is part of Posner’s modus operandi when it comes to Shakespeare, but he’s upending the wrong anticipations in this production. Posner’s theatrical boldness and stellar ensemble-building abilities generally override what unfounded fiddling he does with Shakespeare’s texts (the exception is his 2013 Romeo and Juliet). I had great expectations for what he would do with Shakespeare’s late romance, a roller-coaster ride juxtaposing comedy with tragedy and idealized love with tyrannical jealousy, and I was thrilled to see the cast he assembled. Instead, the production moves at a torpid pace on an overweight stage, designed by Luciana Stecconi, featuring a screen picturing a winter forest at the back, bulky rococo scrolls overhead, musicians singing Irish ballads in one wing, and an anteroom of junk in the opposite wing. Costume Designer Kelsey Hunt effectively uses muted tones in the late Victorian-era, country folk-style clothes of the Bohemians (loose and plain) and Sicilians (lacy and felt); less effectively, the performances are muted, too. With too few exceptions, the actors give little depth or empathy to their characters. Michael Tisdale as Leontes, especially in his stop-the-action soliloquies and asides, measures Shakespeare’s verse not in feet but in miles as the rest of the cast whispers echoes of some of his words. It’s wearying—which, I guess, argues that it thematically succeeds in its intent to replicate a bedtime story. Yes, The Winter’s Tale has an allegorical storyteller running through it, but Shakespeare works it into everyday circumstances through the personifications of characters such as the gossips, the servants, the rogue Autylocus (Kimberly Gilbert), and the part of Time transporting us forward 16 years. Mamillius, son of Leontes and Hermione, offers to tell his mother a story. “I will tell it softly; Yond crickets shall not hear it,” he says referring to her hovering waiting women, and he starts whispering it in her ear as his own life story is about to end. This winter's tale is told in the construct of everyday life, and so is the manner in which Shakespeare positions tragedy as only a misperception or a memory away. It is memory—ours and that of the characters—that manifests the tragedy inherent in the play's romantic (i.e., comedic) ending. Posner physically erases that memory and its purposed impact. First, Mamillius is a puppet played and spoken by Ralston. In itself, that is a fine stage device, as I've seen puppets make great characters, be they children, fairies, King Cymbeline, or three-fourths of the characters in Posner’s 2006 production of Measure for Measure at the Folger. Then, Hissom's doubling of Camillo and Antigonus becomes a clumsy plot device in the final scene after everybody is restored and paired, husband and wife, parents and daughter, friend and friend. Only Paulina (Grace Gonglewski, who gives a forceful performance) remains alone as we hear reported that she had just learned that her husband, Antigonus, was eaten by a bear. Leontes then bestows Camillo on her as a husband, and when Hissom removes his glasses, Gonglewski's Paulina looks on him with relieved recognition before they hug. So, is he now Antigonus who merely exited, pursued by a bear? It may be a metatheater thing—or a mess-with-your-head thing—and it may be intended to make the happy ending whole. But it diminishes the lingering ghosts of Leontes' inane jealous fit: the unnecessary deaths of his and Hermione's son (here presented as a puppet, not human) and Paulina's husband (who turns out to be Camillo as well as Antigonus and the ubiquitous Storyteller). The Folger's previous production of this play in 2009 landed this emotional punch best with a production's framework of a man reading a story to a boy: The two actors also played Antigonus and Mamillius and remained on stage at the end watching the rest leave them behind. Shakespeare configures The Winter's Tale's internal emotional wallop in a political context. The welfare of two kingdoms are at stake as Leontes' eruption of jealousy turns him tyrant. That context gets buried here under so much obtuse staging. Shakespeare's text, without the interposing of whispered echoes, displays the lethal role of self-centered perception as Leontes reads conspiracy into the behaviors of Hermione and Polixenes (Aldo Billingslea) while everybody else sees honorable, platonic, and duteous affection. Leontes accuses Camillo of treason in absentia though he actually commissioned Camillo to aid him in a murder conspiracy. Hermione defends herself with obvious logic that Leontes dismisses as lies, and he essentially considers Apollo's oracle as fake news. I grant we sometimes go to the theater to get away from the headlines we read on Google News and hear from TV talking heads. However, aside from the fact that is hard to do with almost any Shakespeare, so relevant are his works to our own times, to bury those elements of this play is to undermine The Winter's Tale of its dramatic tension. Meanwhile, textual manipulations and pacing skim the play of its personality and comic substance. A staging device also literally mutes another of the play's cultural relevance. Katie deBuys presents an ever-graceful Hermione in her opening scenes, maintaining her composure even in the discomfort of her ninth-month state of pregnancy. In her trial, a gaunt deBuys, wearing a plain white gown, no makeup, and her hair slicked back, maintains her composure, and though physically feeble, she remains stout in spirit as she delivers her great defense speech. "Sir, spare your threats," she almost roars after Leontes warns that she is facing execution. "The bug which you would fright me with I seek." After point-by-point establishing the tyrannically abusive behavior her husband has subjected her to, she crescendos with "Therefore proceed. But yet hear this: mistake me not; no life, I prize it not a straw, but for mine honor, which I would free, if I shall be condemn'd upon surmises, all proofs sleeping else but what your jealousies awake, I tell you 'tis rigor and not law." Also crescendoing is the rest of the cast in a humming soundtrack that eventually overwhelms deBuys' speech. Why someone would think this speech needs a dramatic soundtrack baffles me; that Hermione's heroic moment—wonderfully played by deBuys—is given such trite treatment bugs me, too. Two other performances are allowed to soar: Drew Drake as Florizell and Ralston who, after vocalizing the baby (and her puppet brother) in the first half, plays the teen-age Perdita in the second half. Drake and Ralston bring a jolt of youthful energy to the action and a lilt of sweet romance to the tone. In their first scene together, Florizell, in his disguise as a shepherd swain, references the mythological gods who disguised themselves when pursuing women. "Their transformations were never for a piece of beauty rarer," he says. Ralston's Perdita, with a lusting expression, puts her hands around his waist and pulls in close to him, but Florizell forestalls her as he continues his speech: "Nor in a way so chaste, since my desires run not before mine honor, nor my lusts burn hotter than my faith." He later goes all pentecostal in praising Perdita, leaving her in awe and accepting his marriage proposal despite her misgivings that the revelation of his true identity will lead to disaster. This is the truest, most honorable Florizell I recall encountering, a formidable foundation of unconditional love that will never give way to the tyranny of his father, Polixenes. Nor will Florizell give in to Perdita's giving up on their love when Polixenes finds them out and threatens death for her adopting father and torture for her. In Drake's Florizell and Ralston's Perdita, we see a relationship of trust, devotion, and respect absent in the other royal relationships in this play. “I have loved this play for a long time,” Posner writes in his program notes. “I think it is very strange and very wonderful. It defies simple solutions or pat answers.” Exactly: Yet, Posner can’t help looking for more complicated solutions outside the text and amping up the strange while removing what's truly wonderful in Shakespeare's evolving plot. This Winter's Tale continues a Folger Theater trend of directors approaching Shakespeare with a stated attempt of bringing a fresh perspective to Shakespeare by imposing their will on Will. Freshness, in fact, is inherent in the language and theatrical instincts of Shakespeare's scripts as written and can surface when played with textual fealty in current contexts. I'm seeing not merely "fresh" but cutting-edge Shakespeare around the country this year by other companies and directors who rely on listening intently to what Shakespeare's characters speak. It is exemplified in such products as Fiasco Theater's text-centric production of Twelfth Night in New York and American Shakespeare Center's original-production-process staging of Hamlet in Staunton, Virginia, both of which rely totally on what Shakespeare has written to provide rivetingly new stagings of these plays; or as Brave Spirits Theatre's fourth-wall shattering production of Coriolanus across the river in Arlington, Virginia, a fledgling, low-budget company that lets Shakespeare lead its productions to visceral theatrical experiences; or as the Children's Shakespeare Theatre's Merchant of Venice in Palisades, New York, the young actors discovering and enacting their own personal experiences in Shakespeare's words. Yes, preteens are showing more intellectual enterprise approaching Shakespeare than what I've been seeing recently from Folger Theater directors and other established (and well-endowed) Shakespeare namesake companies that envision Shakespeare's scripts as trappings rather than substance. Mamillius offers his mother either a merry or a sad tale: Shakespeare gives us both in one. The Winter's Tale is a tale of a king driven to tyranny by misplaced jealousy and incensed by his own misperceptions, a court that capitulates to a fatal degree, a true love nearly confounded by another king's tyrannical whims, a Bohemian community celebrating nature in their earth and their hearts, and rich comic moments, even in Sicily and even in the wake of a simultaneous shipwreck and bear attack. It all leads to a happy ending threaded through with too-vivid memories of how tyrannical bents have left two loved ones dead. It is not an ancient tale; it is Shakespeare's observation of us and our current society. So much potential, all right there in the text, most of it missed. So we leave this production to its own final word, yet another extra-textual piece of stage business: "Finis," says Hissom, the Storyteller. Maybe that's French for "sleep tight."